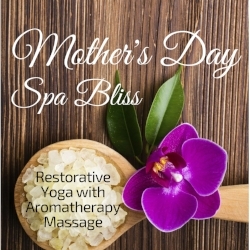 It's Mother's Day and that means pampering and treating yourself to an afternoon of self-care at Spa Bliss! Restorative Yoga and Aromatherapy Massage with licensed massage therapist and yoga teacher, Sandra Sādhāna. Space is limited to 18. Pre-registration strongly recommended.